Introduced in early 1967, the Mark 3 sports car received the first facelift since production began five years before. This involved raising the front bumpers, adding reversing lights and a folding soft top, and improving the interior. However, the main feature involved boring out the original engine from 1147 cc to 1296 cc which now developed 75 bhp at 5500 rpm, and 75 ft/lbs of torque at 4000 rpm. Fitted with a four speed manual gearbox with optional overdrive, it produced a top speed of 95 mph, with 0-60 mph in 13.6 secs, and a standing 1/4 mile in 19.3 secs. However, in 1969, to comply with US emission control regulations, compression was reduced to 8.5:1 and a milder camshaft was used which reduced output to 68 bhp and 73 ft/lbs of torque, with 0-60 now down to 14.3 secs. New seats with headrests were now added. 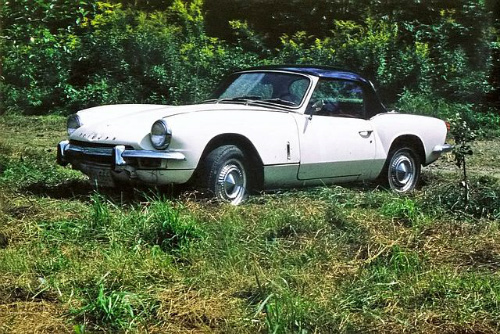 When production ended in 1970, a total of 65,320 Spitfire Mark 3 sports cars had been built, with three quarters being exported, mostly to the US.